Watch out for Vel’Koz jungle next. Splyce pulled out the Vel’Koz AD carry against SK Gaming today while tied 1-1 in their first playoff match of 2019—and they saw great success with it. Splyce’s longest-standing player, Kasper “Kobbe” Kobberup, piloted the champion today, marking the first Vel’Koz ADC in the history of the LEC and its previous incarnation, the EU LCS. 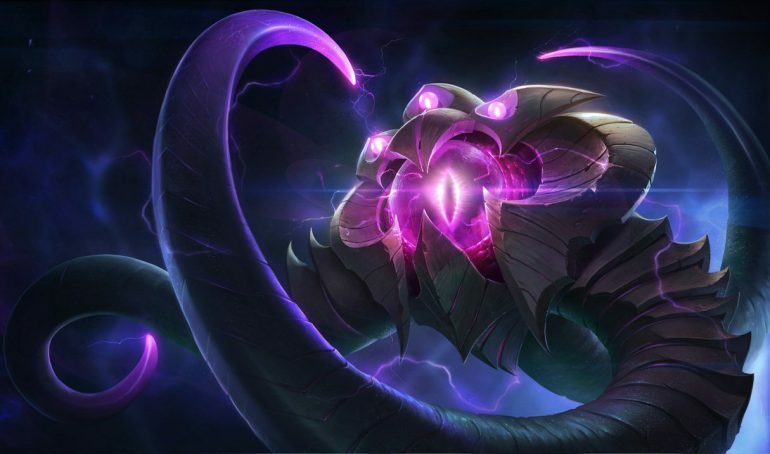 As an annoying mage with tons of crowd control abilities, Vel’Koz became a bot lane bully for Splyce, with Kobbe and support Tore “Norskeren” Hoel Eilertsen constantly pushing SK’s duo to their tower. But rather than try to play through the Vel’Koz, Splyce used their bot lane pressure to focus on getting top laner Tamás “Vizicsacsi” Kiss’ Jayce ahead. Splyce’s plan was successful, with Vizicsacsi gaining a huge top lane lead with the help of Andrei “Xerxe” Dragomir’s ganks. After demolishing SK’s top lane Jarvan IV with ease, Vizicsacsi freely splitpushed all the way into SK’s inhibitor turrets while the rest of Splyce roamed around as a four-man unit. If Splyce sensed any danger, they could immediately join Vizicsacsi via Tahm Kench’s Abyssal Voyage. Although Vel’Koz is a mage, Splyce’s use of the champion was very AD carry-esque. Whenever a fight broke out, Kobbe was just bursting out damage from a distance—as seen at the game’s end, where SK attempted a desperate Baron play. While the rest of his teammates jumped in to the pit, Kobbe shot his abilities from a distance that SK couldn’t reach. With SK left aced after their botched Baron play, Splyce ended the game, forcing match point in the series. The winner of today’s match will face Fnatic in the 2019 LEC Spring Split semifinals.